FRESH BEANS (Maxibel Green Bean): very slender green bean with firm texture and good taste. See Week 8 for usage and storage information. BEETS: You will receive Chioggia (Italian variety with leaves all green and pink-striped stems; root has cherry red, candy-striped flesh and has a sweet flavor) or Golden Beets (orange skin with rich gold interior; mild, sweet flavor when cooked) with no greens. See Week 3 newsletter for usage and storage information. CABBAGE: You will receive Gonzales (a sweetly spicy green mini cabbage with 4-6-inch heads). See Week 9 for usage and storage information. SWEET CORN: You will receive Montauk (small, fancy, bicolor kernels on 8” long ears with superior, sweet flavor) and/or Potawatomi (yellow kernels with excellent sweet flavor). See Week 12 for usage and storage information. EGGPLANT: You will receive Nadia (slender, purplish-black, glossy-like, bell-shaped fruit), Rosa Bianca (an Italian heirloom; round fruit streaked with white and violet), or Orient Express (long, lavender fruit). See Week 11 newsletter for storage and usage information. *Genovese Basil—All shares will receive some mighty amazing basil this week (an herb with sweet, spicy, shiny, green leaves). With the cold weather we’ve been having, we really would encourage you to take this opportunity to dry it, freeze it, or make pesto, since it may not last much longer. We supply it with root attached, so it will last up to a week or two longer. KALE: You will receive Lacinato Kale (dark green, noncurled, blistered leaves, but heavily savoyed) or Green Curly (well-ruffled, curly green leaves on green stems; this variety makes a good, roasted “kale chip”). See Week 1 newsletter for usage and storage information. ONIONS (Sterling): White, globe shaped, mildly pungent onions. See Week 10 for usage and storage information. HOT PEPPERS: You will receive Poblano (black-green chili pepper, heart-shaped fruit, which is mildly pungent with a lightly sweet, medium-hot flavor) and Jalapeño (small and conical pepper, ranging from green to red; hot chile pepper used commonly in Mexican or southwestern cooking). See Week 12 newsletter for usage and storage information. SWEET PEPPERS: You will receive Carmen (6 inch long, tapered fruit that ripens from green to a deep “carmine” red; sweet taste in salads and when roasted and fully red-ripe), Sweet Sunrise (medium-large, blocky, yellow-orange pepper; fruity, sweet flavor), or Red Knight Bell (big, blocky, thick-walled, green-to-red pepper with sweet flesh). See Week 16 for usage and storage information. POTATOES: You may choose from Red Norland (smooth, red skin and white flesh; great baked, boiled, or roasted), All Blue (an heirloom potato with deep blue skin and flesh; moist texture; perfect in salads, baked, or boiled), and Yukon Gold (yellowish brown skin with yellow dry flesh and pink eyes; long storage and good tasting; perfect baked, boiled, mashed or fried). See Week 9 for storage & usage information. RADISHES: You will receive Pink Beauty (pink-colored root with mild, spicy flavor) or Amethyst: bright purple skin and crisp, mild white flesh. See Week 14 for usage and storage information. U-PICK RASPBERRIES (only available on the farm): The sweet fall red and golden raspberries have begun. 1 pint is available as part of your share this week, only if you are able to come out to the farm and pick it yourself. Any extra pints picked will be $4/pint. SALAD MIX: a mix of baby greens—arugula, spinach, spicy greens mix, baby lettuces—Green and Red Oakleaf, Red and Green Romaine, or other leaf lettuces. See Week 1 for storage and usage information. SUNFLOWER SEEDS (Russian Mammoth): You will each receive a 6 to 12 inch sunflower seed head from our friend, Ben, who grew these organically on his farm in Michigan Center “just for fun”. Thin-shelled, striped seeds are plump, meaty and very plentiful. Sunflower seeds are 24% protein — richer in that mineral than any other food except egg yolks and liver; also contains other minerals, vitamins, and essential acids. **This seed head is not completely dry, and needs to dry for about a week or until the seeds come easily out by rubbing the head. This link has some very helpful directions on how to take care of your seed head: http://www.wikihow.com/Harvest-Sunflower-Seeds. How to use: Once seeds are dry, roast for 30 to 40 minutes, or until golden brown, at an oven temperature of 300 degrees Fahrenheit (149 degrees Celsius). Stir the seeds occasionally as they roast. You can also leave the seed head outside for the birds to eat. Can also be saved for seed planting next May or June! How to store: Once the dried seeds have been taken off the sunflower head, transfer to an airtight container and store in the refrigerator or freezer for several months. TOMATOES: We pick heirloom tomatoes slightly green to prevent splitting and damage, while transporting. Heirlooms are softer and more perishable when ripe. Best to store upside down at room temperature until completely ripe. You may choose from a variety of Heirloom tomatoes such as: Japanese Black Trifele, Pruden’s Purple, Rose, Striped German, Black Krim. You will also receive some Geronimo slicing tomatoes. Keep in mind these are very easy to freeze. Just throw the tomatoes into freezer bags after cutting off spots or core. See Week 9 for storage and usage information. WINTER SQUASH: Everyone will receive Spaghetti Squash (3-5-pounds, pale yellow, oblong, smooth, medium size, only mildly sweet with “spaghetti” (stringy) flesh; bake like squash or boil and fork out the flesh, topping the “spaghetti” flesh with your favorite sauce; mildly sweet). You will also receive a choice of Acorn (small, green ribbed squash with pale yellow flesh; great stuffed with rice, breading, or soups) or Delicata (small, oblong, creamy colored with long green stripes, only slightly ribbed; pale yellow, sweet flesh; edible skin; best eaten within 4 months of harvest). How to use: Roast in oven, saute chunks in skillet, boil or steam chunks for 15-20 minutes, or until tender (peel skins off “before” or “after“ cooked, but “after” is easiest when it’s cooled); mash cooked squash with butter; purée cooked squash for creamy soup, or add uncooked chunks to soups or stews; add small amounts to yeast breads, muffins, cookies, pies, oatmeal, etc. How to store: Keep for several months (depending on the variety) in a dry, moderately warm (50-60 degrees), but not freezing location with 60-75% humidity; will also store at room temperature. 1. ENDING SUMMER CSA DATES: The end is drawing near. This is just a reminder that our summer shares are ending in just a few weeks. That means Oct. 9 (Wed.), Oct. 11 (Fri.), and Oct. 12 (Sat.) are the last distribution days. 2. EXTENDED FALL CSA SHARE AVAILABLE FOR 2013: We are offering an Extended Fall CSA Share for $96 for 3 weeks from Oct. 13 through Nov. 2. All forms will be attached to a more detailed email notice this week, and also will be available at every distribution site. If you’re interested you can return your registration form by e-mail, send it in the mail, or put it in the labeled envelope at the distribution sites. Registration and full payment due by Oct. 13. Non-members are welcome, so encourage others to register now. **Chelsea Farmers Market will not have a distribution on Saturdays though for the Fall Shares, and the Saturday Washtenaw Food Hub will shorten its hours from 10 AM until noon. The other distribution sites and days are the same. 3. THANKSGIVING SHARES! We are offering a distribution in November for you to stock up on vegetables before the holiday or for winter storage for $110. This share will be available for pick up only on Nov. 23, the Saturday before Thanksgiving, at the Ann Arbor Farmers’ Market from 7 A.M. until noon or at Tantré Farm from 2-5 P.M. A $50 deposit can reserve your share, but full payment is needed by Nov. 10. All forms will be attached to a more detailed email notice this week, and also will be available at every distribution site. Non-members are welcome, so encourage others to register. 4. THANKS FOR COMING TO THE TOMATO PRESERVING WORKSHOP! During the workshop our enthusiastic participants managed to put up 82 quarts of canned tomatoes, 10 gallons of frozen tomatoes, 1 gallon of roasted romas, and 5 trays of dried Juliet tomatoes, all between 1 and 4 pm on Sunday! This is an incredible amount of help from our community of CSA members for our winter preservation! All went home with 1 jar of canned tomatoes. Thanks to Kristen Uthus, who facilitated the workshop and all the hardworking participants, who now will have at least 1 jar of tomatoes put up for the winter. Many went home with their own box of tomatoes to preserve as well. 5. SOLD OUT! 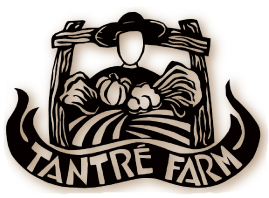 “FIELD TO PLATE” STROLLING SUPPER: This “Progressive Dinner” at Tantre Farm on this Wednesday, Sept. 18 from 6 to 9 PM is Sold Out, but if you want to put your name on a Waiting List, please send me an email with your phone number, first and last name, in case someone else cancels. 6. FALL WORK PARTY/END-OF SEASON POTLUCK is this Sunday, Sept. 22 from 1-4 P.M. Members are invited to bring family and friends to help harvest squash, pumpkins, and potatoes before the first frost. You may also come just to enjoy the farm and walk around or enjoy a wagon ride to see the produce and the animals, or just enjoy good food anytime between 1 and 4 P.M. We also will have sit-down activities, such as onion/garlic cleaning or stripping herbs. All who come will be able to take something home with them, such as a pumpkin, a winter squash, a pint of raspberries, and even hand-picked flowers. BAGS, BAGS, BAGS!! We still could use some if you have some, but only grocery size please, NOT bread bags or small sizes. 7. HARVEST AT THE FARM: Please call ahead if you plan to pick on other days besides Farm Distribution Days (Wed. and Fri.), so we can make sure someone is around to help you. U-pick Flowers—This week you may pick 1 bouquet of up to 20 stems for “free” as part of your share. You may want to bring a vase or a jar to keep your flowers fresher on the ride home! U-pick Golden and Red Raspberries—1 pint free with your share, and $4/pint for additional pints. Preheat oven to 375 degrees. Halve the squash and scoop out seeds. Bake face-down on oiled sheet until it is easily pierced by a fork, about 30 minutes. Let stand until cool enough to touch, then scoop out pulp and place in large bowl. Meanwhile, heat butter and sauté onions, garlic, and mushrooms with herbs, salt and pepper. When onions are soft, add tomatoes and continue to cook until most of the liquid evaporates. Stir this mixture into squash pulp with remaining ingredients except Parmesan. Spread into buttered 2-quart casserole. Top with Parmesan. Bake uncovered for 30-40 minutes. Serves 4-6. Slice in half lengthwise, scoop out seeds and place face down in baking pan. Add just enough water to keep squash from drying out and hasten cooking. It will need to bake at 350 degrees for 40 minutes to 1 1/2 hours, depending on size. Cook until very tender, but not charred. It may be served in skins or scooped out and mashed. Add butter and salt or brown sugar and maple syrup to the pulp.